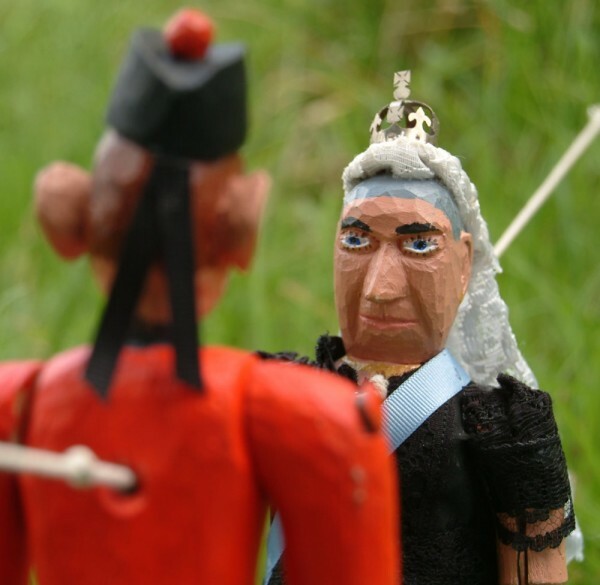 I was recently commissioned by a Punch and Judy professor to make a pair of marionettes à la planchette depicting an elderly Queen Victoria and a contemporary Black Watch Highland soldier. It proved to be a huge amount of work, but I am very happy with how they turned out. Marionettes à la planchette are designed to dance to music like jig dolls; the most important difference being that they are operated by a string tied to the performer's leg, which allows the performer to stand up and play a musical instrument (or two) at the same time. Their feet make a tapping sound when they dance, providing an additional percussive element to the performance (with practice it's possible to vary the strength of the taps to emphasise the beat of the music). There are drawings dating back centuries showing street entertainers performing with this type of puppet, often featuring two puppets on one string. Apparently they are commonplace to this day in parts of mainland Europe. See the Pipe and Tabor Compedium for some nice historic illustrations. Also this lovely engraving from 1821. The pole has a hole in the top into which I inserted a fresh spear thistle flower (national flower of Scotland!). The Highland soldier puppet is called Jock McJig, and I generally refer to the Queen Victoria puppet as Vicky. Vicky's blue sash represents the Most Noble Order of the Garter. Under her dress is a stiff wire-frame crinoline that gives it the correct shape while allowing her legs to move freely enough to dance. 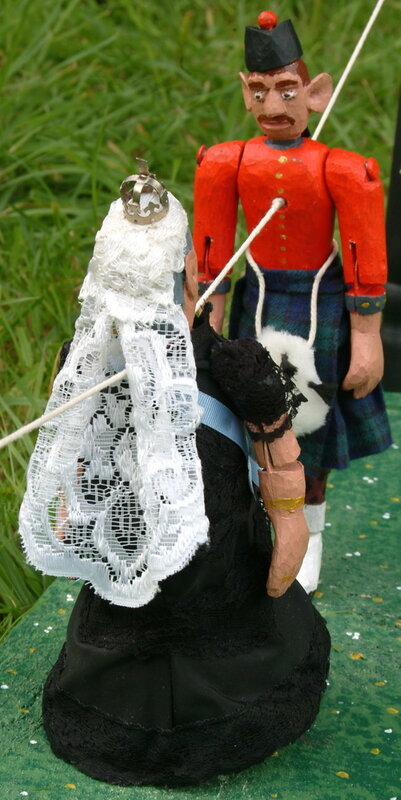 I put quite a lot of time into researching the details of Jock's uniform: his sporran even has five tiny hand-made black tassels. It took me two attempts to get Jock's kilt to fit nicely. 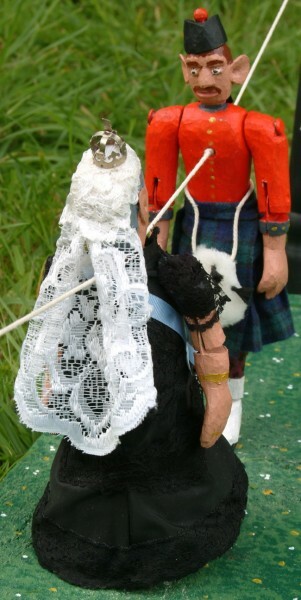 His Glengarry bonnet and toorie (the red pom-pom) are whittled from a single piece of wood. Vicky's dress has short sleeves because it allows her elbows to move freely. Vicky's white veil (and petticoats!) are made from net curtain fabric. Jock's moustache is fairly authentic for the time period. The detail I'm most proud of is Vicky's crown, which I made from German Silver to a design I based on her iconic Small Diamond Crown. Incidentally, I deliberately didn't use any sandpaper to remove the tool marks from the carvings. I have in the past sanded my puppets to produce perfectly smooth surfaces before painting, but I have since formed the opinion that the knife facets are part of the character of the puppets and enhance rather than detract from their appearance. Thanks to wibble_puppy for operating the camera, watervole for suggesting the tune, and the local flock of sheep for cheering at the end (at least I choose to believe they were cheering!). 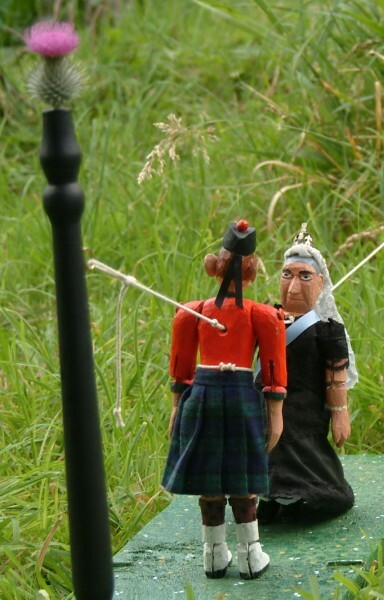 The little extra bit of knotted string near the pole is an idea I stole from inspired by Jody Kruskal - the idea is that the performer can use it to give control of the puppet(s) to a member of the audience. 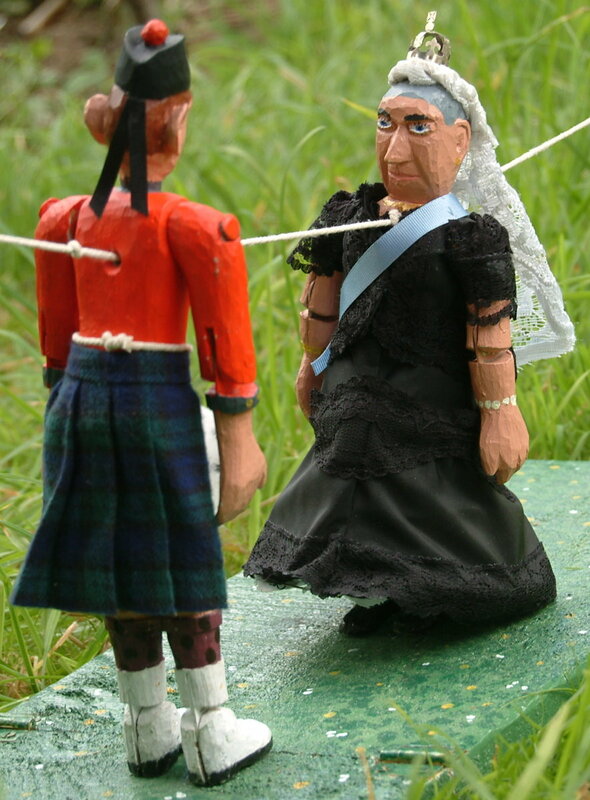 Jock has so far had one public appearance (Vicky's outfit wasn't finished in time, and we decided it might be seen as improper for her to dance in her underwear). I wasn't able to be present at the gig, but I've been told he was a big hit, particularly with the kids. I am willing to consider commissions to make more marionettes à la planchette, however you should be aware that many hours of work go into crafting puppets with this level of detail (particularly if they require an intricate costume like Queen Victoria's). 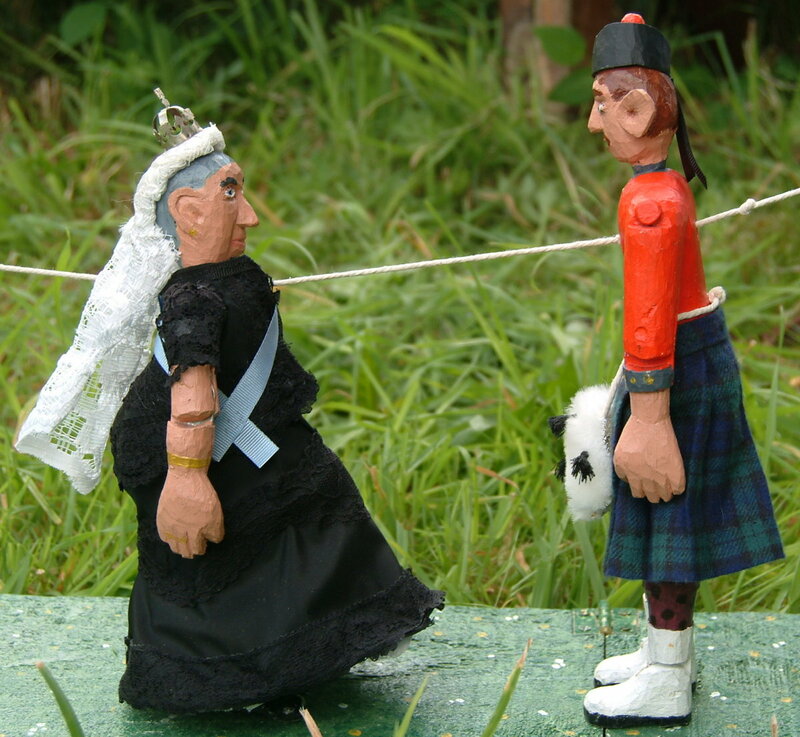 I can also make simpler, less realistic puppets and jig dolls. If you are interested, please drop me an email (alex at alexholden dot net).